After a leisurely breakfast, we checked out of our hotel about 10:30, picked up our car and began driving westward along the coast. From our guidebooks we expected a string of jewel like towns along the coast, fishing and resort villages, steeped in personality. The drive was pretty, but the roads were torturous and busy and Gerry, trusty driver that he is, could not see anything while concentrating on the road. There were lots of pullouts, and we made use of them both to stop to take pictures, and also to let the cars behind us pass. 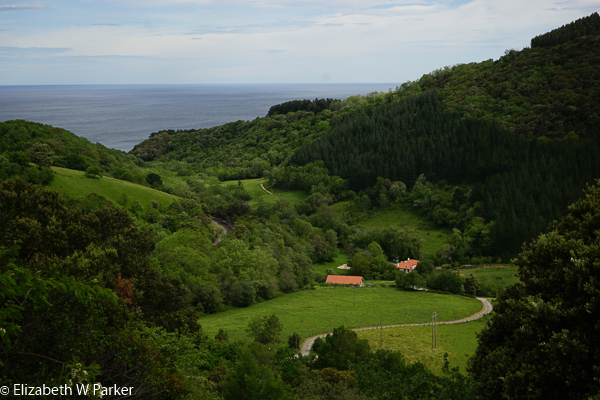 We made a brief stop in Getaria but, finding nothing of interest to us, we continued on past Ondarroa. 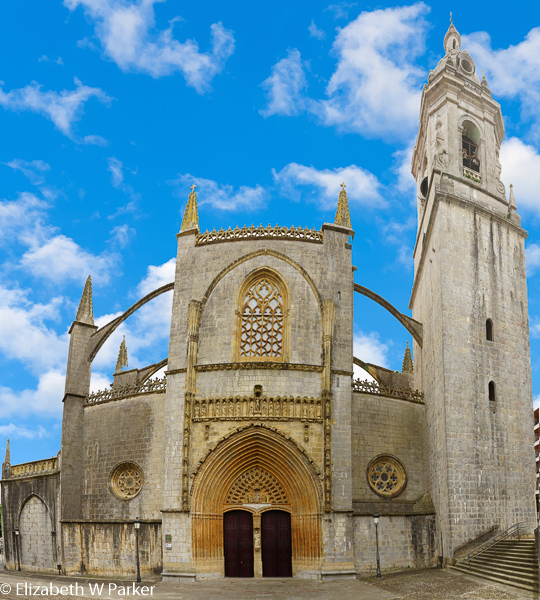 The towns were not as picturesque as we had hoped, but we made a longer stop at Lekeitio, getting out of the car and taking a walk to see the cathedral, to make a stop in a pharmacy along the plaza and finally, to eat a fish lunch at the port. 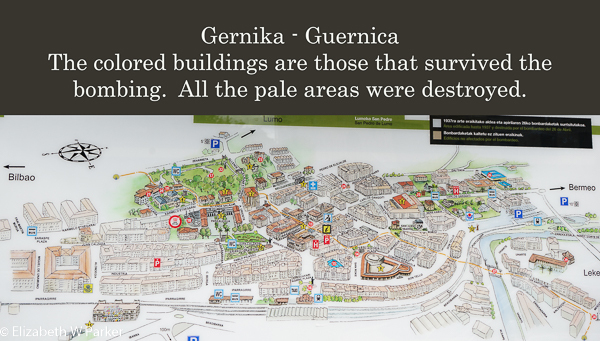 After lunch, we aborted our mission (to continue along the coast to more promised towns) and went to directly to Gernika (the town of Picasso’s Guernica). When we arrived everything was still closed and so we had to wait until the town’s cathedral bells sounded the stroke of 4 to enter the little park area that we wanted to see. We spent out 15 minutes or so learning about the bombing, which wasn’t difficult because we parked right where the bombs fell that destroyed the town on market day killing more than 2000 people. That was April 26th, 1936. The bombs were dropped from Nazi planes hired by Franco. It was sobering to see the before and after pictures of the devastation and to read eyewitness accounts by people who made it into the shelters and survived. To stand and look around you, you wouldn’t believe that anything had ever happened. The town has rebuilt itself, and the scars, physical and emotional, are not on public display. 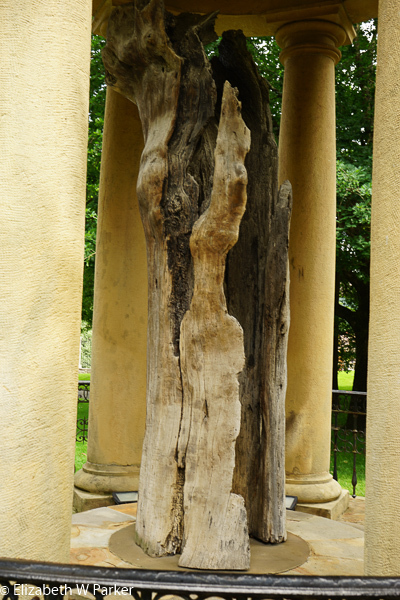 But, the bombing is not the only reason one comes to visit Gernika – there is also the tree! Throughout its history, the rulers of the Basque region (even when they were kings and queens of Spain) vowed to respect the rights and privileges of the Basque people under an ancient oak tree that grew in Gernika. The tree is now within the parkland of the building that was used for regional councils in later times. The tree is a symbol. There is a venerated fragment from an ancient tree on the grounds…though it is not, perhaps, from the oldest tree that fulfilled the symbolic function, it is still a symbol of how old the tradition is. And like any decent living tradition, you can also visit the newest symbolic oak – one planted in 2015, its age then 15. The room where the council meets is rich with symbols of the tree, and also showcases the names and dates of rulers who swore the oath. Gernika is quite an interesting stop despite being a bit out of the way. It was after 6 pm by this time, so once back on the road, we drove directly to Santillana del Mar, a place we stayed just one night. We arrived in Santillana del Mar in the pouring rain! The streets to the hotel were so narrow in places we feared scratching the rental car! We made it to the door of the hotel, the Casa del Marques, and there was help right inside the door for suitcases to be brought in and directions given to the car park. We had an unexceptional but tasty dinner at the Gran Duque restaurant, around the corner.